If you're like most marketers, blogging is your top priority. But it's a huge investment. To make the most of your blog, you need to pay attention to every aspect – from planning and creating to promoting and analyzing. 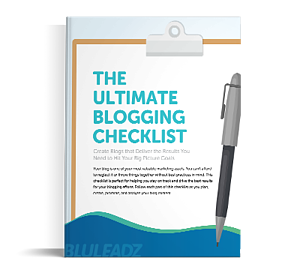 This is where The Ultimate Blogging Checklist comes in handy. It's a comprehensive checklist that delivers actionable tips for every stage of your blogging process. How to build a targeted blog content strategy based on buyer persona research, keyword research, content calendars, and more. Proper optimization best practices, including tips on linking, formatting, creating calls to action (CTAs), and using keywords. Tactics for distributing and promoting blog content through your subscriber list, online communities, and social channels. The important role analysis plays in blogging and how methods like historical optimization extend the shelf life of your content.